Amelia Elizabeth Guppy was “a lady of wildly independent mould and adventurous spirit, as well as of considerable talent as an artist”. She turned her talents to photography becoming only the second woman to join the Photographic Society in 1853, and first woman member to exhibit photographs the following year. 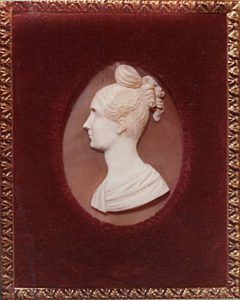 Amelia Elizabeth Parkinson was the daughter of Richard Parkinson (1782-1851) and Lucy Lechmere Parkinson (1788-1834), born into a comfortable life at Kinnersley Castle, Herefordshire. Her baptism took place on the first day of 1809, six weeks after her birth on 21st November 1808. Amelia’s brother John Parkinson arrived in 1810, inheriting Kinnersley Castle on their father’s death in 1851. Lucy Lechmere Parkinson was an accomplished artist, also designing stained glass for the nearby church of St James. Her daughter showed artistic talent at an early age, further cultivated by tuition from the drawing master for Miss Crouchers’ School for Young Ladies in Hereford, David Cox (1783-1859). Also a highly respected watercolour landscape painter, Cox nurtured Amelia’s natural creativity, later adapted to photography. 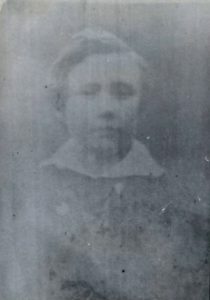 Robert and Amelia had four children: Lucy Lechmere (1835-1907), Robert John Lechmere (known as Lechmere) (1836-1916), Henry Francis Jeune (1839-1872) and Margurite Eleamire Clotilda (1840-1873). Lechmere later became a respected Palaeontologist after whom the “Guppy” tropical fish (Poecilia reticulata) was named. Robert Guppy referred to his new wife as having “impulsive enthusiasm with a love of beauty and adventure”. 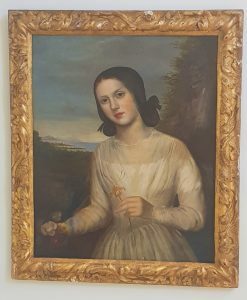 She needed no persuasion to move to Trinidad in 1837, where her husband had been commissioned to assist with the legal challenges resulting from the abolition of slavery. On the western side of Naparima hill, Robert bought two adjoining properties, one described as “elegant”, called Amelia Cottage. It is unclear when Amelia adopted photography, progressing seamlessly from painting with a brush on canvas, to painting with light. 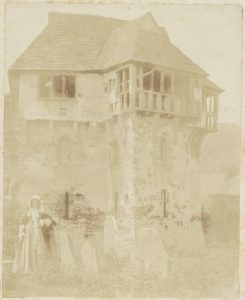 Some of her earliest calotype photographs date from 1846, just six years after its invention by William Henry Fox Talbot. Amelia mastered photography during its infancy, though it has not been established who may have introduced her to the new art. She had links to the inventor of the calotype, William Henry Fox Talbot, also her brother in law, Samuel Guppy, or possibly Calotypist Henry Collen. She showed broad photographic interests from nature landscapes to classic architecture, from ancient relics to portraiture of her son Lechmere. The establishment of a Photographic Society reflected an enlightened approach to the inclusion of women, welcoming ladies under rule nine of their agreed constitution. Amelia joined Elizabeth Vignoles, becoming the second woman to take up membership. Her election was on 10th March 1853 and, though resident in Trinidad, remained a member until 1859. During one of her visits to England in 1854, Amelia became the first active member of the Photographic Society by displaying four photographs in the first exhibition of its kind. She chose Stokesay Castle in Shropshire as a striking example of thirteenth century fortification, also the subject of a study by antiquarian Thomas Hudson Turner (1815-1852) published in 1851. “Garden Terrace”, “Druid’s Oak” and “Entrance to Ludlow Castle” completed the selection of calotype prints exhibited by Amelia, in the company of other Photographic Society member Mary Anne Boulton and Catherine Verschoyle. 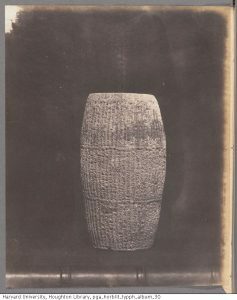 Amelia’s photographic portfolio extended further than many of her contemporaries, into active preservation of antiquities belonging to her distant relative Sir Thomas Phillips. Showing great skill, precision and attention to detail, she used photography to document some of his enormous collection of books, urns, seals and maps. 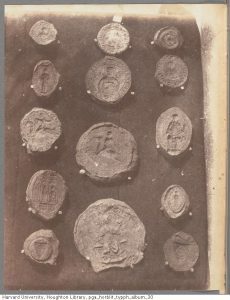 In 1853, sixty six salted paper prints were bound into a volume entitled Mrs. Guppy’s photographs at Middle Hill, comprising Latin manuscripts and documents; cuneiform tablets; wax seals (“Utrecht seals”); a reproduction of an oil painting of Phillipps’ daughter, Maria Walcot; and reproductions of drawings of architectural details of Postlip, a house in County Clare, and the Bell Inn, Waltham St. Lawrence, Berkshire. As a trained artist Amelia would recognise the strong, directional lighting required to clearly display the raised relief of a wax seal, in contrast to the opaque even light required for the reproduction of a painting. These unique images combine past, present and future in an innovative use of new technology to preserve historic artefacts, one described as “Dust”. It’s not known if she carried on with photography but her independent spirit was irrepressible and in 1871 at the age of 63, she took herself off to Venezuela to explore the plant life along the uncharted Orinoco river on her own. She was gone for over a year, tackling rapids, dense jungle and tropical fever and returned with a collection of rare orchids and a series of spectacular watercolours. Amelia’s great life adventure ended at the age of 78. She died in Trinidad on 27th July 1886, described by her granddaughter as “an old woman burned out by her own flame”. But Amelia’s photographs remain as a self portrait of an extraordinary life, a free spirit opening a unique window into the early history of photography. Yseult Bridges, ed. Nicholas Guppy, Child of the Tropics: Victorian Memoirs (London:Collins and Harvill Press, 1980) p.71. Yseult Bridges, ed. Nicholas Guppy, Child of the Tropics: Victorian Memoirs (London:Collins and Harvill Press, 1980) Guppy family tree. Morning Post – Wednesday 19 November 1834, p.4 col.5. Albert Carl Ludwig Gotthilf Günther, Catalogue of the Fishes in the British Museum. (London: Taylor and Francis, 1866) p. 353. Journal of the Photographic Society, March 3rd 1853, Vol. One p. 4, “Rules of the Photographic Society”, 9.That Ladies shall be eligible as Members of the Society.